Meet Alea Morren, entrepreneur who started Momma Fox Toys, inspired by her son Adlai who was born with a rare genetic condition called FOXG1 (follow their story on Instagram or Facebook). 50% of her profits are donated to support the International Fox G1 Foundation. As the owner of a small business making handmade trendy items for children, I've always worked from a place of being inspired. My son, Adlai (AD-lay), was the spark that lit a fire in me, helping me find a channel for my creative energy. I began making specialized sensory toys and bibs for Adlai in late 2014 when we were living in Montreal, Canada. He was around 3-years-old at the time. It corresponded to a time of improved sleep for me, since Adlai's medical condition was stabilizing. In 2015, we relocated to Pittsburgh PA, mainly for the weather (lol! ), schools and services for Adlai. I set up shop in the basement and started making products for infants, toddlers, and older children (up to age 10). My main products are baby shower gifts (blankets, burp cloths, bibs), items to help toddlers look cool while simultaneously messy (bandanas), and items to engage imagination for older kids like chef sets/art aprons and tool belts. I also started making more items for mothers like bags, nursing scarves and nursing pads. But my special niche is items for special needs children/people, which include sensory toys, large/oversized bibs, tie bibs and wheelchair capes. I have always been interested in artistic projects. As a child I made up games creating color combinations and loved having coloring competitions with my friends. I was good at drawing and loved the attention it gave me, (attention deprived as 1 of 5 children). In school, my favorite part of book reports was creating the title page. After high school, I entered a special art school with studio courses in everything from sculpting and painting to ceramics and textiles, and subsequently went to University for Interdisciplinary Studies in Fine Art in Montreal. Suffice it to say, I've always had an artistic bent, and have always coped with stress through some form of it (journaling, painting, drawing). So why is Adlai my inspiration? Adlai is very unique. He was created with an extremely rare genetic mutation (about 300 people known to have it in the world), called Fox G1. Mainly, it affects the brain, and as a result, much else in the body is also affected--low muscle tone, digestive issues, immune issues, and vision problems. His brain is smaller than normal, and he has fewer neurons. His brain is simplified, with fewer folds than the typical brain. The front and back are less developed, and the hemispheres are very weakly connected. As a result, he has seizures, difficulty learning, remembering, and doing higher order things, like speaking, walking, and even sitting up without support. His early first couple of years were very hard, to put it mildly (living hell to be precise). His immunity was poor, and he would get sick easily and suffer greatly. He has severe reflux, and due to the pain from that, would scream daily from 1am-4am, without pause. He struggled to cope with the sensory input from his surroundings--loud noises, certain textures, etc. would set him off. Going grocery shopping or to the mall was no fun. No fun at all. When he started trying to eat solids, at 10 months, it would take three hours to feed him (after an Olympian effort), and by then it would be time to eat again. 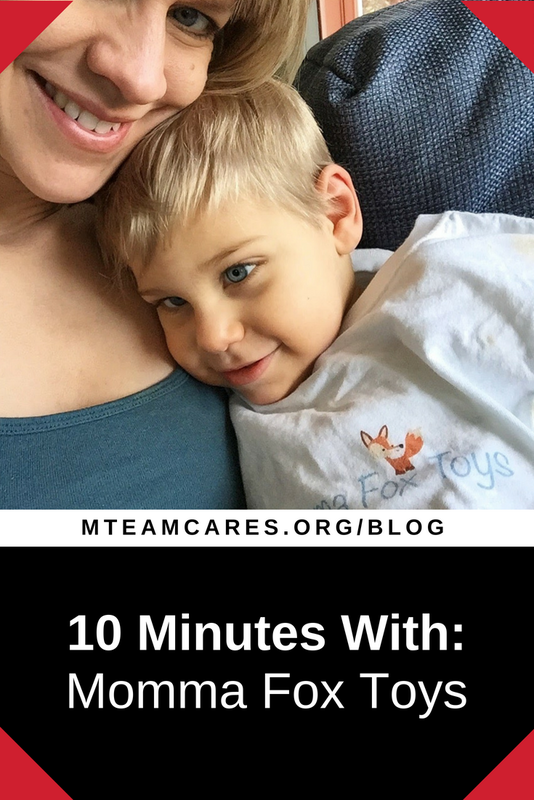 At 1-year-old, we received the diagnosis of FoxG1, and over that next year, we had about four terrifying ambulance rides to the ER until his seizures were under control. Living through those years was very difficult and I also had his older sister, Arielle, to raise. I rarely slept and struggled with depression. But once some things got a little easier--for example, establishing some therapies, figuring out feeding strategies, finding resources around me (six hours of respite each week--yay! ), I was able to apply what I was learning about sensory processing disorders and some neurology into improving Adlai's life. I started to make toys that had lots of ribbons and high contrast colors, with textures and colors he liked, since the toys in the stores were often too loud, hard, and bright. I needed toys that could strap down to his tray, to allow me to have time to make a meal or do a quick chore with him playing nearby. Adlai was seriously the messiest eater I'd ever seen! I decided to try making bibs (large full ones) that would stand up to that mess. So my bibs are cotton on the front, to absorb liquid (otherwise it was in his lap), and waterproof underneath (cause they get soaked! ), with adjustable snaps at the neck to last a long time. From there it was pure evolution. I'd have an idea, and try to make it. It was becoming my outlet. I started to feel a bit more normal. Eventually, I had baby showers coming up and started getting more creative. I went all out, making baby blankets and burp cloths. Then I started thinking about what I could make for my older daughter (then age 5) and made an art apron, oven mitts, and a cute chef hat. Then it was a carrier for her doll, worn like a Baby Bjorn carrier, and things have just continued from there. I have a 1-year-old now (soon to be 2) and so I started making teethers and baby hats and stuffed dolls, and now I'm really into baby leggings. I am continuously thinking of my kids and what they're into and use them to test my products. My oldest even consults on fabric choices and styles sometimes. In fact, my favorite thing to do while nursing my baby (and that is seriously hours in those early days), was designing products in my mind that would address some need or problem or have some unique feature. The kids would finally be down to sleep and I'd run downstairs at 9pm and sew until midnight! This last year, I've been working a bit less on new product design, and more on stocking for craft fairs like Handmade Arcade (such a good fair!). I sell in a local shop (So Me Jewelry and Gift Shop) and produce for custom orders. With the birth of Anna in 2016, it's been a challenge to be productive and to have regular working hours (as any mother of young children knows), but I still find sewing to be a healing process for me. Having my own "work", separate from my children is vital. It allows me to reconnect with myself-the person I was before kids and before disability, to find my 'flow'. I work in a spirit of service and try to channel love as I work. I consider each piece I create to be a work of art, one that has come into the world through me, and often also through collaboration. I love to hear about who the piece will go to. If I'm making a baby shower gift set (my best seller), I like to find out about the mother, her style, her preferences, if there are siblings, things the family really likes, and get a sense of that family before I sit down to design. Then I'll confirm with the person ordering and proceed. I've had a couple people come back to me to report that their gift was the favorite of the shower! Hearing that makes all work and sacrifice worth it. I'm looking forward to a time when I can dedicate a solid block of time each day to building up the business (producing more, getting into more stores, serving more people) to ultimately be able to donate more the International Fox G1 Foundation, which funds research and supports families of children with Fox G1. This Foundation was started by five mothers of children with Fox G1 in 2012, and at that time, was virtually the ONLY source of information on the condition back then (it was founded in the same month we got our diagnosis). Now, this incredible group supports families like mine with a toy sharing program, acquiring medical equipment and hosting conferences to network and share knowledge. They're working with groups like the Retts Foundation, and others who support knowledge about people with neurological disabilities. They are a force! So I am one of about 300 other Momma Foxes out there! I named my company Momma Fox Toys in Adlai's honor, understanding that every child has the need to play and learn to the fullest that their capacity will allow. Whether I'm making a custom toy or wheelchair cape, a baby blanket or nursing pads, what I'm trying to do is to use my gifts and talents to solve a need, to make life a little easier, to create more beauty in the world and to touch the hearts of everyone I interact with. That is certainly one of the many things Adlai has taught and shown me. In fact, Adlai is one of my best teachers. Adlai cannot speak with his mouth, but he communicates love so clearly. He is simple but also pure. He is difficult at times, but never malicious. He will always be innocent. His smile lights up a room, and when he looks directly at you with those huge blue eyes, it's like the sun is shining on a cloudy day. He is so utterly beautiful and I know that he is how he is for me, for you, for the world to learn something. People like Adlai test us. They test our compassion, our humanity, our maturity and our character. The test is for me, as his parent, for his siblings, for his caretakers, and ultimately, for society at large. This past spring Adlai moved into a residence for people with special needs. They have 24/7 staffing and can meet Adlai's needs in a more sustainable way than we can at home. He is safe, and thriving. We are also less stressed and more capable of meeting the needs of our other kids and life is a little bit calmer (to say the least). I am so grateful that we can see Adlai regularly and can participate in special outings with him and the whole family. I'm at what a good friend referred to as, a "fertile void". I'm adjusting to my new reality, reassessing where I'm at with things, seeing how the girls are responding to this major change, and I'm looking forward to what comes.